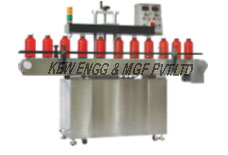 Induction Sealing Machine | KEW ENGG. & MFG. PVT. LTD. Employs the principles of electromagnetic induction. Induction head with motorized height adjustability.